GPS technology developed by University of New Brunswick scientists is set to begin orbiting the Earth this month aboard the SpaceX Falcon 9 rocket as part of a Canadian Space Agency mission that will, in part, monitor space weather. The Telegraph Journal featured the full story on its front page Monday, September 16. FREDERICTON - An advanced global positioning unit designed by University of New Brunswick scientists soon will be launched on a mission to probe potentially dangerous space weather in the earth's upper atmosphere. The GPS unit is one of eight instruments scheduled to fly on CASSIOPE - the first made-in-Canada multi-purpose small satellite mission from the Canadian Space Agency. While the launch scheduled for Sunday was scrubbed, Richard Langley, professor in geodesy and geomatics engineering at UNB, has his fingers crossed the rocket carrying the payload will blast off in about two weeks. Langley is patient. He has been involved in the project for the past 10 years. "So it has been a long time coming to get to this point where the satellite will actually be launched," he said in an interview. The GPS unit and other research instruments designed by scientists in several Canadian and international universities, will be launched into space aboard the SpaceX Falcon 9 rocket. 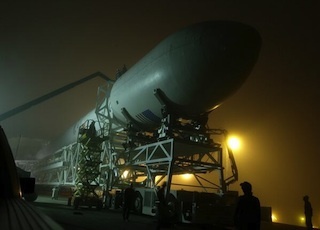 The rocket will be fired from Vandenberg Air Force base in California. Langley, a principal investigator behind the scientific portion of the CASSIOPE mission, said the UNB equipment will help position the satellite in space. But it also will help with the pure science of the mission - to determine the density of electrons in a part of the upper atmosphere called the ionosphere. It will be the first time that GPS is used on a Canadian satellite to study the density of the electrons making up the earth's ionosphere. "This instrument will help to assess space weather," Langley said. "That's a term that describes the various phenomena that come about as a result of interaction between the sun, the earth's magnetic field and the earth's atmosphere." Storms of solar particles and intense sub-storms of ionizing radiation can interfere with high-frequency radio communications, disrupt electrical power grids and distort the global positioning systems that help guide aircraft. Langley said there are both practical and scientific benefits to learning more about the ionosphere and space weather. The ionosphere, which is made up of ions and electrons, is part of the earth's magnetosphere - a region of the upper atmosphere governed by the earth's magnetic field. Langley said it forms a magnetic cocoon that protects the world from a lot of "the nasty stuff" coming from the sun. "When we have periods of significant space weather, they are usually accompanied by aurora and sometimes large perturbations of the earth's magnetic field that can even affect pipelines and electrical fields," he said. Once the satellite is launched, it will start generating data which Langley and other scientists will analyze and share with the other instrument developers and with the scientific community in general. The scientific mission's aim is to help researchers understand the cause and effects of potentially dangerous global space storms as well as "sub-storms" that occur mostly above earth's polar regions. Scientists say that better understanding may make it possible some day to "forecast" space weather. CASSIOPE measures 1.8 metres by 1.4 metres and weighs 481 kilograms - small compared with larger commercial communications satellites. It will fly in a slightly elliptical orbit that goes back and forth, over the equator, from the north to the south polar regions. "It's a small satellite, but there will be times you'll be able to see it with a telescope," especially in dark skies away from urban light pollution, said Andrew Yau, a University of Calgary professor of physics and astronomy, and project leader. Scientists hope to collect data from the satellite instruments for at least two years, although most of CASSIOPE is designed to last about five years, before its orbit decays and the satellite re-enters earth's atmosphere and burns.